THERE IS A NATURAL INCLINATION IN THE MINDS OF MANY PHOTOGRAPHERS to fall in love with systems…widgets, intricate calculations, work-arounds, gimmicks, diagrams, gadgets, toys. We like to tinker, to play Workshop Edison. Let’s see what happens if I do this, connect these, try it without that. We love convenience and simplicity, but a Dark Gearhead lurks within us all as well, trying to reduce photography to a series of technical solutions, intricate puzzles. And so we see-saw. We selectively want our cameras to seamlessly carry out our wishes without a lot of bother and to make things as complicated, as hands-on, as feasible. It’s a strange balancing act. Almost immediately after the mad global crush we all experienced at the virtually effortless ease of cell phone cameras, there was a countervailing energy to add on to the things, to make them do more, be better. First was the tidal wave of apps for the post-processing of all those quick snaps. Then followed the tsunami of toys and add-ons that were designed to compensate for the device’s technical limits. This ever-expanding array of screw-ons, extenders, mini-tripods and effects lenses make the simple iBricks in our pockets look like pocket weapons given to Bond by a nervous Q. Do try to bring the ordinance back in one piece this time, 007. The rig seen at left is by no means the most complex set-up I’ve found in recent years for enhancing cell camera proficiency. In fact, on the fussiness scale, I’d say it scores roughly in the middle, although I think it’s off the charts for excessive intricacy (too many parts), annoyance in operation (wait a second till I get this out of its cool carrying case and assemble it!) and plain damned silliness (no example required). I’d also stipulate that I haven’t seen a lot of such contrivance actually being used in the field, that is, nowhere near the “market penetration” of the dreaded (and soon, Dear God, to be become obsolete) selfie-stick. Still, this kind of iPhone-based arms race for additional macros, fisheyes, and other optional optics begs a few questions. For starters, is the convenience/portability feature that made millions love and use these cameras now on the wane(doubtful)? And as a follow-up, if you require this level of accuity in your picture-taking experience, why not simply buy a conventional (notice I did not say “real”) camera and be done with it? The twin impulses of make-it-easy and make-it-complicated will continue their ages-long tug-of-war for the photographer’s soul, and perhaps that’s part of the fun. Both paths can lead to both excellent and execrable images, so, as we frequently conclude, the results, and not the toys, are what truly matter. This entry was posted on February 20, 2019 by Michael Perkins. 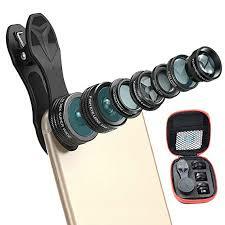 It was filed under celphone cameras, Equipment, iPhone, Post-processing and was tagged with accessories, attachments.